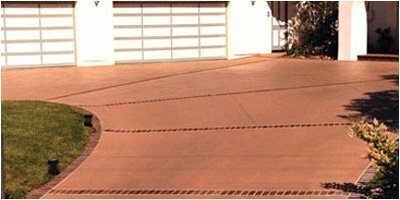 Color Deck & Driveway Stain/Coating | Protects & Beautifies | Superior Industries, Inc. The toughest of all epoxy modified acrylic colored coatings, Decra Kote 4000 is designed to protect and beautify residential and commercial driveway and walkway surfaces.This 2 coat system stops moisture, freeze/thaw damage and protects surfaces for up to ten years.Available in a wide variety of colors, Decra Kote 4000 will compliment any décor. (See Color Chart)This stain/coating can be used with confidence on interior and exterior surfaces including brick, concrete, pavers, masonry, asphalt and metal. 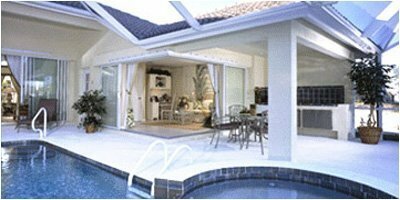 In addition, Decra Kote 4000 is easy to apply and contains no harsh or toxic fumes. When applying this coating to steel troweled concrete, (slick dense finish) Decra Kote 4000 should be thinned using 1 part water to 1 gallon Decra Kote 4000 on first coat. The second coat should be applied undiluted. For application on metal surfaces, a suitable metal primer is required before applying Decra Kote 4000. Our #5501 primer is excellent and can be used with confidence to insure proper adhesion and bonding of Decra Kote 4000. No primer is required when applying to asphalt surfaces. When a higher gloss finish is desired, Aqua Crete is recommended for a final topcoat. GL-600 Non Slip aggregate is included in each kit and is recommended where slip hazards may exist. 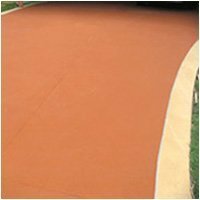 GL-600 is mixed into the first coat of Decra Coat 4000 and creates a texture for helping eliminate slip hazards especially on inclined surfaces. The resulting non slip texture can be considered “friendly” to barefoot traffic. When applying Decra Kote 4000 to Garage Floors, Driveways and other areas with vehicle traffic , Aqua Crete should be used as a final topcoat for added color and wear protection. This clear coating gives added protection and color enhancement and extends the expected life of Decra Kote 4000. Aqua Crete creates a semi gloss appearance. Decra Kote 4000 may be applied using a brush, roller or spray type equipment. See Technical Data page for complete application instructions.